Criminal justice is one of the most flexible academic areas of study, and students in Illinois have a wide variety of options when it comes to earning a degree in criminal justice. Criminal justice schools in Illinois train graduates for an array of potential career paths, working in law enforcement, corrections, law practices and the judicial system. Illinois boasts a workforce of nearly 200,000 people in legal and protective services across the state, with approximately 135,000 of those working in Chicago alone. Illinois has a growing criminal justice industry, with numerous occupations showing higher long-term growth projections than the national average. Prospective students can use the following page to read about degree options, compare criminal justice schools in Illinois and learn about criminal justice employers and jobs in the state. After Criminal Justice School in Illinois: What's Next? Prospective criminal justice students have a wide range of options when it comes to criminal justice schools in Illinois. To help in the decision making process, check this list of the top programs, ranked based on a variety of the most important factors to students, including tuition costs, graduation rates and student-teacher ratios. Criminal justice offerings at Danville Area Community College include associate degrees and certificates in both law enforcement and corrections concentrations. No matter which track students choose, they will be provided with a range of student services to help them advance toward graduation. This includes academic advisement, as well as financial services. Library services include research guides and databases, and an assessment center helps students test for a variety of placements. The Career and Employment Services Center is open to all students, who are also invited to join any number of clubs and organizations on campus. Richland Community College offers criminal justice programs that result in basic certificates, advanced certificates and associate degrees. Students can choose from four potential areas of concentration: patrol officer, parole officer, correctional officer and probation officer. Whatever field of study students choose, they will have access to computers and laptops, free tutoring and academic advising. The library is involved in an interlibrary loan program, and students are provided with research assistance as well as literary workshops and instruction. Anyone who needs it can take advantage of the math assistance center, and the school also offers transfer assistance to students. 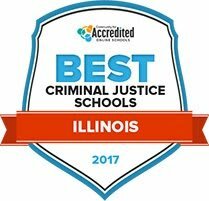 The 60-hour criminal justice program at Illinois Central College results in an associate in arts degree. All students must pass a basic skills test and meet with an academic advisor before being admitted into the program. The college will help each student find an advisor specific to the field of criminal justice. Students can use the library to find the journals, papers, books and ebooks they need for their studies or recreational use. The Studio is a literacy and writing center that helps students improve their critical thinking, writing and reading skills. Students can also take advantage of several learning labs, which offer free tutoring across many subjects. Criminal justice students seeking to enter the workforce immediately after graduation should pursue the associate in applied science degree, while those who want to transfer to a four-year institution and complete their degrees should opt for the associate in arts degree program. Rend Lake College also offers a range of certificates, including a new cyber forensics specialist program. The college provides a broad array of services to all students, no matter which track they choose. Academic advisors help students set up schedules, learn about programs and pick classes. Students also have access to admissions and financial aid advisors. There is also a career center, child care and tutoring. The Shawnee Community College criminal justice program explores concepts like criminal law, ethics, security and safety, and criminal behavior. All students are welcome to participate in a number of programs and activities on campus, including theater, athletics and several clubs. Students also benefit from the college's fitness centers, and are eligible to utilize the school's career services programs, library services and tutoring offerings. The Student Success Center provides computer assisted instruction and tutorial instruction for a large number of classes and subjects. Free, confidential counseling services are available to all students. At Lewis University, students can pursue a bachelor's degree in criminal justice either through on campus learning, or entirely online for a more flexible schedule. The university also offers a master's program in criminal justice for those who are looking to further their studies. Students can participate in extracurricular activities like club sports, spiritual organizations, and theater. The Lewis University Center for Health and Counseling is available to all students as a resource to help promote mental and physical health on campus. A career services center is available to help students with resume writing, interviewing and job hunting. Students who graduate from Quincy University with a bachelor's degree in criminal justice will learn about the criminal justice system and will be prepared to enter careers in law enforcement, criminal profiling, and private security. The clubs and organizations on campus provide students with opportunities to get involved and enhance their education with extra-curricular activities. A walk-in medical clinic is available to all students to provide health care, over the counter medication, and minor physical injury supplies. Counseling services are also available to those who are struggling. Students can seek out the multicultural programs on campus to help promote values of diversity, inclusion, and leadership. The University of Illinois at Chicago offers a bachelor's degree in criminology as well as a master's degree for those students who are looking to further their studies. They will take classes about courts in society, police in society, and criminal justice organizations. The university offers areas for recreation to promote fitness, and a wellness center to help promote physical and mental wellness on campus. Honors students offer free tutoring in almost every subject to every student on campus. To ensure students have the best opportunities available to them, the Office of Career Services helps students with resumes, interview practice, and job hunting. After graduating from Judson University with a bachelor's degree in psychology and a concentration in criminal justice, students will be able to pursue careers in public service at the local, state, and federal levels. Students can get involved on campus by joining clubs and organizations from spiritual, to athletic, academic. The university health center is available to students to provide health and counseling services. Free in person and online tutoring is also available to all students at Judson University. To help with the job hunt, the career services center offers resume advice, practice interviews, and networking services. Through the criminal justice program at Loyola University of Chicago, students can earn a bachelor's degree in criminal justice and criminology and forensic science. For the students who wish to further their education, a master's level program in criminal justice and criminology is also available. Student run clubs and organizations from spiritual, to political, to academic are on campus to enhance students academic experience and get them involved. The wellness center on campus offers medical assistance, treatment, and information, as well as counseling services to help students through hard times. Free in person tutoring is available to all students in almost every subject. Numerous higher education institutions offer criminal justice programs at the undergraduate and graduate level. Yet, these programs vary in length, curriculum focus and specialization within the field, amongst other things. For a more complete list of criminal justice school options in Illinois, use the search tool below to compare degree concentrations, financial aid and tuition, enrollment numbers and other key factors. Nearly 200,000 individuals work in criminal justice in Illinois. Employment opportunities can be found across the corrections, judicial and law enforcement systems at the local, county and state level. Although police, sheriff and state patrol officers remain a well-known employment path for criminal justice students in Illinois, the table below includes a variety of the most popular career paths for students to consider after criminal justice school in Illinois. For those considering a career in criminal justice, it is important to understand the potential return on an educational investment. Attending criminal justice school in Illinois may have some advantages when it comes to earning potential after graduation, considering average salaries are higher than the national average for several professional and legal service occupations in the state. Job growth also trends well for certain criminal justice jobs in Illinois. Scroll over the graphs below to see where these potential careers stack up in Illinois compared to the rest of the nation. Criminal justice is one of the largest employment fields in Illinois, especially in Chicago. Approximately 130,000 individuals are employed in a variety of legal and protective service occupations in the greater Chicago region alone. Students interested in mapping their career options after criminal justice school in Illinois can scroll over the markers below to find more information on the areas that have the highest concentrations of criminal justice employees in the state, and see how much these professionals make annually by area. One of the largest chapters of ACC in the nation, the group supports the in-house business legal counsel community in Chicago and throughout Illinois. The Department of Business Affairs and Consumer Protection is responsible for inspecting business and ensuring they comply with city laws and regulations. The Business Resource Center is an informational hub that provides a variety of business compliance resources regarding city, state and federal regulations and laws. This state department provides a wide range of services to the public, business and state agencies around human resources, compliance, marketing and information technology. The Illinois Department of Corrections has job opportunities across its 25 adult correctional facilities, work camps, adult transition centers and boot camps. An advisory group to the Governor, General Assembly and Illinois Department of Human Services focused on delinquency prevention, addressing issues at-risk youth face and creating support programs to help young adults in the juvenile justice system. A nonprofit organization that promotes reform in the adult and juvenile prison systems in Illinois to improve prisoner reintegration into the community. An informational website developed by the Corporation for Supportive Housing that helps formerly incarcerated individuals find the services and housing necessary to reintegrate into society. A multifaceted organization with a range of community projects, including restorative justice that helps victims meet their needs and offenders are prepared to reentry society. A nonprofit organization that collaborates with schools, social services, government agencies and the juvenile justice system in Illinois to expand restorative justice programs in the state. This state agency is dedicated to administrative improvement across many criminal justice fields in Illinois, including law enforcement and the legal and justice system. A state group focused on enhancing youth safety and reintegrating juvenile offenders back into the community. A nonprofit organization that works in criminal justice reform to reduce recidivism rates in youth and adults in the state. The state branch of the American Civil Liberties Union, a nonprofit organization that work in advocacy and litigation on civil liberties issues. The office of the state's chief legal official that offers resources to defend citizen's rights, keep children safe, ensure government accountability and protect consumers. An online hub that offers a variety of legal resources through a community of websites, including IllinoisProBono.org and IllinoisLegalAid.org. A membership based professional group for paralegals in Illinois. Learn more about the profession, networking events and legal resources on this site. A faith-based community organization with chapters across Illinois many counties and rural areas, focusing on legal, justice and civic issues facing communities and individuals. From career information to attorney mentorship, bar exam training tools and more, the Illinois State Bar provides a complete background on the law system in Illinois. A service organization that works to recruit, retain, mentor and professional develop Latino officers working throughout Illinois' law enforcement agencies. A membership-based nonprofit association, the Illinois Drug Enforcement Officers Association provides training to narcotics enforcement officials, including statewide training sessions on critical issues, such as police corruption. A state agency dedicated to monitoring and improving the professional standards used in law enforcement and corrections in the state of Illinois. The primary training body to prepare prospective officers for a future career in law enforcement in Illinois. An organization of more than 200 environmental and natural resource organizations, the CEN offers volunteer and career opportunities in conservation activities, such as urban gardening, composting, recycling and habitat restoration. The state agency responsible for managing natural resources in the state, including hunting and fishing licensing, parks and recreation, conservation and and public safety. Founded in 1972, the foundation works to preserve, protect and restore rivers and watersheds in counties throughout the state. The conservation police agency of the Illinois Department of Natural Resources. Tammy Rinehart Kochel, PhD is an Associate Professor and the Graduate Director for Criminology and Criminal Justice at Southern Illinois University Carbondale. She conducts research on policing and communities, examining public perceptions of police and how policing strategies and behaviors may influence those views. Her focus addresses the factors that promote police legitimacy and the consequences of police legitimacy. She also examines the effectiveness of policing strategies on crime, with an emphasis on targeted approaches such as problem solving, hot spots policing and focused deterrence. What do criminal justice departments look for when considering which students to admit? AI believe that what departments are looking for in a student varies for the bachelor's, master's, and doctoral programs. In all cases, departments want students who are self-motivated, interested in learning and in criminology and criminal justice, hard-working, do the work, are good writers, willing to participate in class, reliable, reasonable verbal articulation/presentation skills, and capable of succeeding in the program and ultimately the work environment. Standardized test scores and prior GPA can provide some indications of a students' capacity to succeed in a college setting. Personal statements can shed light on whether the student has a clear direction and motivation, as well as providing an indication of writing skills and maturity as a student. For master's level applicants, departments are interested in the students with strong critical thinking skills, those that performed at the highest levels in their bachelor's program, and those that their professors advocate can succeed in graduate school. Doctoral students should possess all of these traits, but especially should be able to document clearly in their personal statements their topical areas of interest, research experience, goals for application of the degree, and any specific alignment of research interests with current faculty. Writing, research, analytical and critical thinking skills and independence are essential for success as doctoral students. What makes criminal justice a rewarding subject to study in Illinois? AThere are so many reasons studying criminal justice is rewarding. Crime is a major social issue. Aiming to understand its nature and causes and developing an evidence base about how to reduce and prevent it is inherently valuable. There are many facets to studying crime, criminology and criminal justice and the field fairly new and is growing. It combines concepts from a variety of other fields such as sociology, political science and psychology and so there tends to be something of interest for everyone. Many careers stem from this area of study and expertise including law enforcement-local (loss prevention, sheriff's deputies, detectives, police officers, security, corrections, dispatchers, crime scene, victim advocates), County/State (e.g., probation) and federal (e.g., DEA, U.S. Marshals, Secret Service, FBI, Border Patrol, Immigration). It can be a jumping off point for forensic science degrees, law degrees, social work, etc. Those with advanced degrees have even more opportunities including in policy careers, think tanks and academics. What skills do students need to be successful in a criminal justice degree program in Illinois? AStudents will succeed when they are self-motivated, practice good study behaviors, attend class and do the work required-including following instructions, have good critical thinking skills, can write and speak well and are willing to apply themselves. Given the reports in the media of the violence in big cities like Chicago, how concerned should prospective criminal justice students be about safety when they pursue a career? ASafety has always been a concern for those interested in pursuing a career in criminal justice, particularly for aspiring police officers, probation officers, corrections officers, and those pursuing federal positions. This remains an important issue for those aspiring to serve in these fields and in light of recent events, with officers being targeted and ambushed, I can understand these concerns. Of course, officer safety is also a critical component of training in those careers (beyond the degree). Advances in technology and tactics continue to occur (e.g., reality-based training, foot and vehicle pursuit training and policies, body armor, firearm skills, working with mentally ill subjects, situational awareness training, predictive policing, less lethal weapons, use of force policies). Frankly, some research suggests that as officer experience on the job increases (up to a point), their risk of injury declines. Furthermore, the risks vary in different geographic areas and different contexts even within the same jurisdiction. According to the National Law Enforcement Officers Memorial Fund, in 2015, 123 officers were killed in the line of duty. However, this figure is much lower than we saw in this country in the 1920s and 1930s. In 2014, officers endured 15,725 assaults. Furthermore, an article in Time Magazine in May of 2016, drawing from the Bureau of Labor Statistics Census of Fatal Occupational Injuries, reported that police and sheriff's deputies had the fifteenth most dangerous job in the United States (among those measured), based on fatality rates. They fall behind such jobs as roofers, airline pilots, taxi drivers, truck drivers, farm workers, construction laborers, groundskeepers, maintenance workers and others. Law enforcement remains a noble and necessary position in society. While safety is and should be a consideration for those contemplating pursuing this career, many officers have expressed to me over the years that their motives for entering the profession are a desire to help people. This is not likely to change. However, I believe that the profession and the population more generally is realizing the importance of working to promote better police-community relations, which should also increase officer safety.